All you have to do is ring their sleepy sounds doorbell then wake 'em up and take 'em out. 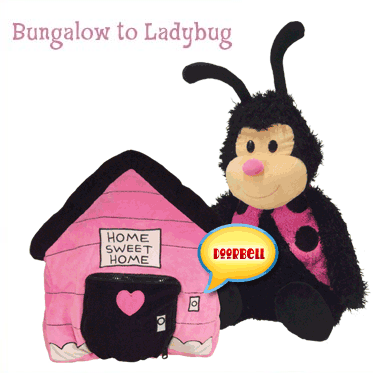 Now it's time to play Home Sweet Home with your Happy Napper. When your finished playing, just give your Happy Napper a hug goodnight, and return them to their Home Sweet Home. The princess, like so many little ones, absolutely LOVES to carry her plush pals around with her everywhere and cuddle with them at night. With the new innovative plush pals from Happy Nappers she is able to cuddle and play with the adorable Ladybug by Happy Nappers (pictured above) during the day, and transform her into a comfy pillow at night (by tucking her inside her "bungalow" for the night). Ringing the interactive working doorbell in the morning and unzipping the door to reveal her adorable friend (and head off on yet another adventure) has become a beloved routine for her. "Lulu" the Ladybug (as she affectionately refers to her new pal) became a fast favorite for my little one, and it's easy to see why........it's just so darn cute! With six lovable choices, Happy Nappers are truly The Perfect Play Pillow's! Happy Nappers are the PERFECT Play Pillow! One Lucky Reader will receive a Happy Napper of their choice! Visit http://www.happynapper.com/ and let me know which Happy Napper you would like to have for your little one? The comment is considered your entry. We would love the Palace Unicorn! We would love to have Castle To Dragon Happy Napper!